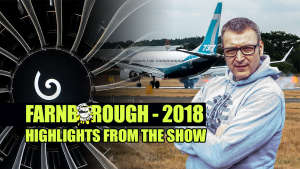 A day out at the Farnborough Air Show as called for and being members of ADS we get a couple of free tickets, and no one likes to pass-up on free tickets! Our office being only a 45 minute journey away, we rocked up early at the public carpark to be ferried in via security to the show. Having never been to the air show before, this was a new experience for us at TDW and we wanted to take our TDW followers along with us for the day. Rather than use this opportunity to do a tutorial, we simply took along our cameras and videoed the day along with taking a stack of photo’s for the TDW magazine. The event itself provided a great opportunity for us to meet with TDW member companies, drop by the booths of those we think should be TDW members as well as meeting old friends for coffee. Watch the full video now and see if you can spot your companies stand or any of the other brands you may recognise. At the end of the day when most people had left Mike took an opportunity for a short live broadcast to our YouTube channel. Before leaving we shared a coffee with Aspire Consulting and Capgemini. Will you be at DVD2018? TDW has been granted a Press Pass to cover the event, if you are there and would like Mike to drop by your booth, please get in touch with us and we will be sure to have you added to the list of companies we should wing by! A trained aircraft engineer (rotorcraft), I entered in to the field of technical information writing S1000D data modules on a major European military platform. After a series of high profile project roles and the privilege of supporting clients worldwide, I ended my 'employed' career at a subsidiary of Boeing Aircraft after I decided to leave and focus on TDW full-time. From my time supporting clients worldwide, I could see that there was a market need for an independent organisation that could be a trusted advisory source for those needing to implement successful technical information strategies. I am passionate about the art of technical communications and the process, software and skills needed in our market. S1000D Objections – what were/are your objections? There’s more to life than S1000D! Do you plan to use ASD S3000L? What do you want from Simplified Technical English? Which editing tool do you use? Simplified Technical English – did you miss our webinar? Webinar Simplified Technical English – Let Us Show You How! Tech Data World App – What’s inside?